With facial photos, this Celebrity Snapshot shows how a fiery Rising Sign and an airy Moon alters the appearance, character and personality of a Capricorn Sun Sign. Against the odds, this thin haired, wispy voiced goat was determined to make it on his own! Nicolas Cage changed his name from Nicolas Coppola to avoid coasting on his uncle Francis Ford Coppola’s famous name. Such tenacity is expected in the character and personality of a Capricorn Sun Sign. More so, in his 1989 film Vampire’s Kiss, he even ate a live cockroach on camera! Clearly, he give his all for his art, proving the adage that these goats will eat a tin can to prove a point! Nicolas also show us how progressions can alter ones’ creative urges—and well as the changes they will make in their careers. In 1987, Uranus was transiting Cage’s Ascendant and his Sun was progressed into Aquarius. In this “Uranian period”, Cage pursued his offbeat and eccentric roles as the hapless bandit in Raising Arizona and as Cher’s reluctant beau in Moonstruck. This earned him recognition as a character actor. By 1995, as Cage’s progressed Sun approached his natal Venus and Saturn in mid-Aquarius, he found his first marriage, as he reaped Saturn’s rewards with his Oscar winning role as a suicidal cynic in Leaving Las Vegas. When his progressed Sun conjoined Saturn in 1998, Cage’s Capricorn Mars prevailed in his bulked-up action hero roles The Rock and Con-Air. 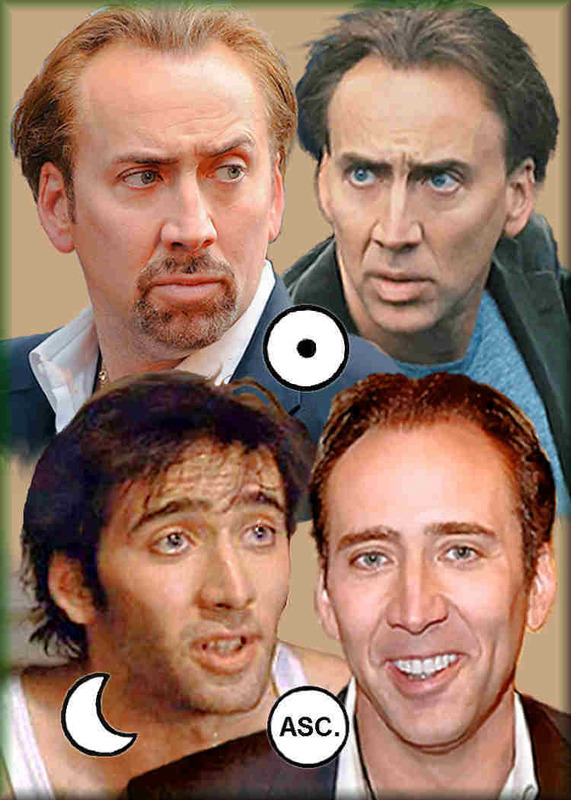 After 2000, Cage’s “absurd-side” returned when his Ascendant progressed into Aquarius. There, we saw the beginning of his fun and wild National Treasure adventures. With his hangdog nature, Capricorn Celebrity Nicolas Cage was one of the 1980’s least likely stars. Who’d expect someone with such a “sleepy” appearance to succeed in movies, much less in action films. With Venus on his Sun’s ruling planet Saturn and a Venus-ruled Moon, the granite edges of his Sun soften, when he presents the effeminate and lethargic qualities of Venus. These Venusian forces show when Nick reacts to others. It explains why he rarely shows aggression when he becomes emotional. However, the persona that he presents with his Centaur Ascendant is far more adventurous! In interviews, Cage usually trots on to the stage appearing jubilant and restless. You might be able to see the fiery sparkle in his eyes. Once seated, Cage slowly removes the fiery shield as he begins to express his solar energies. Bit by bit, the expressions become more firm and ever more serious. Before our eyes, the free spirited horse transforms into a well-grounded, wily goat. The energies of expression may change, but the physical container (the bone structure) is defined by the Ascendant. Consequently, Nicolas shows many of the qualities seen in a Centaur. He has a long face and jaw, and like a horse, the neck stretches out far beyond the shoulders. Also, the lengthy thighs and arms accent a lanky body. When Cage’s cardinal luminaries recede, the underlying bone structure displays the patterns of mutability, rather than the sharp, angular lines of cardinality. Here, the cautious and contained personality of a Capricorn Sun Sign is less noticed. He first appears to be an adventurous Soldier of Fortune!